CHARLOTTE, NC – Come out to Topz Healthier Burger Grill in Ballantyne, on the corner of Lancaster Highway and Providence Rd. West, between 11 a.m. and 9 p.m. on Saturday, May 15 to support Birthday Blessings. 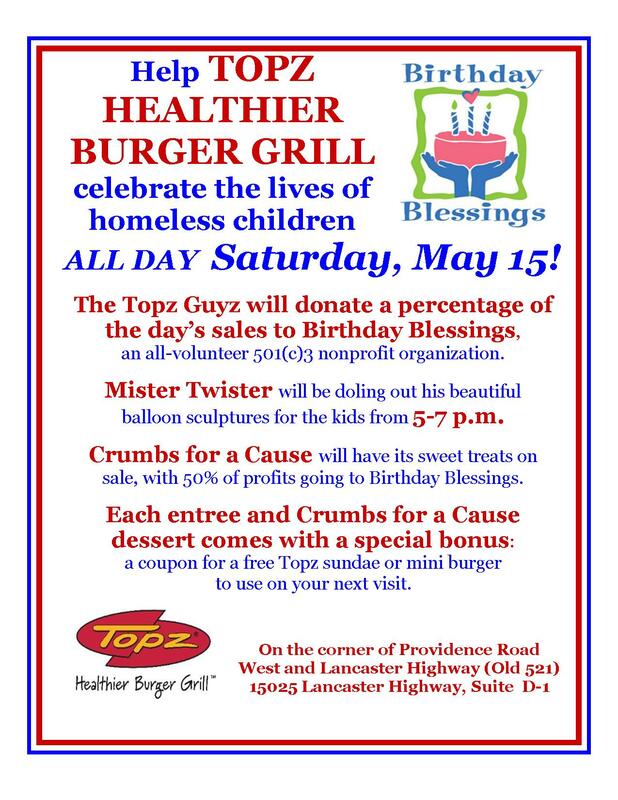 Mister Twister will be doling out his balloon sculptures for the kids from 5:30-7:30 p.m., and Crumbs for a Cause will have its sweet treats on sale all day, with 50% of profits going to Birthday Blessings. If you spend at least $20 dining at Topz on May 15, the restaurant will give you a key to the Queen City, a complimentary Be Our Guest TownCard (valued at $20), which offers special access to rewards at a vast variety of local restaurants and shops. Each Topz entree and Crumbs for a Cause dessert comes with an added bonus: a coupon for a free Topz sundae or mini burger to use on your next visit. While you’re enjoying your yummy and fun-filled meal at Topz, make sure you say hi to Rebecca from South Charlotte Macaroni Kid. She will have macaroni crafts on hand to keep little fingers busy. If you’re looking for the scoop on family-fun events in the South Charlotte/Ballantyne areas, be sure to sign up for her e-newsletter here. Help us promote this event by sending this link to your friends and printing this flier. Entry filed under: Sponsors and Partners. Tags: Crumbs for a Cause, Mister Twister., Topz Healthier Burger Grill. Guys With Ties dinner at Chima Brazillian Steakhouse, May 17	Help wanted: Enthusiastic people to join Project ARCH!